If you don’t want to spend a lot of money on a VPN, but you also don’t want to put up with the severe limitations that come with many free VPN services, Leafy VPN may offer an ideal middle ground. Leafy offers a free trial which you can use to test out the services. If you are happy with what you experience, you can enroll in a monthly plan. Monthly plans cost just $9, and if you enroll for a year at a time, you can drop that cost to under $6 per month. That is quite affordable for a company which offers unrestricted speed and traffic, allows you to unblock any website you choose, and provides VPN servers in more than ten different countries. On the whole, we were impressed by Leafy VPN’s services, especially in terms of security, country options, and pricing. There are a few drawbacks when it comes to customer support and speed, which we will discuss in more detail later on in the review. First, let’s talk about the main reasons you may want to use Leafy VPN. • You are on a network which blocks access to sites like Facebook, Gmail, or Twitter, or you live in a country where you cannot access the content you are looking for on Hulu, BBC, or other streaming video websites. 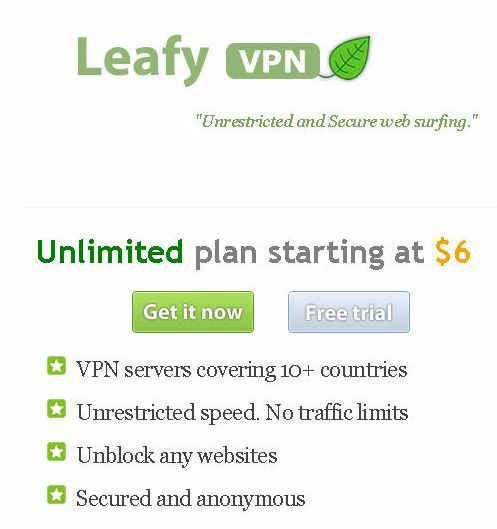 Leafy VPN can allow you to unblock this content and access it from anywhere. • You are on an unsecured network you do not trust and wish to browse safely and privately. Or perhaps you wish to screen your identity because you do not trust the authorities in your country or you are in a hostile situation. • You want to enjoy the refreshing speed which comes from browsing on Leafy VPN. Leafy VPN also promotes itself as an excellent tool for gamers looking to drop their ping time and experience less lag on multiplayer games. Whether or not this is true on the other hand probably depends on your luck when you log in; Leafy VPN may speed up your connection sometimes and slow it down on other logins. Let’s take an in-depth look at the features of Leafy VPN, starting with supported devices. Microsoft Windows: Windows 7/8, Vista, XP, 2000. Apple: iOS, iPhone, iPad, iPod Touch. Some operating systems only support PPTP connections, which may be something of a drawback for some users. Leafy VPN runs on iOS, Windows, and Linux, and apps are available for a wide range of mobile devices. So you can use this program on your Mac or Windows or Linux PC. You can also download it for Apple iPhone, iPad, iPod Touch, or Android. You may also download it for your router. 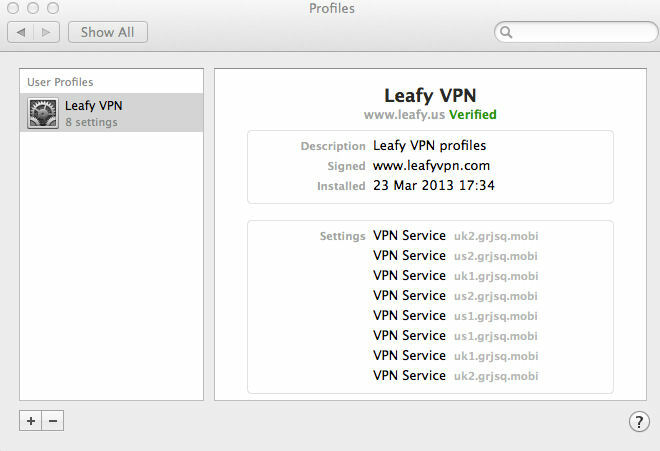 You can sign up for a free trial with Leafy VPN by providing your first and last name and your email address. Once you have completed that step, you can setup the VPN on your system (detailed instructions are provided for all devices). At that point, you have three days to test drive Leafy VPN and make up your mind about whether you wish to purchase a monthly plan. While this is not a long time period, it should be plenty to test the speed and the different sites you wish to access. Many VPN companies do not even offer a fully functional trial, so this is a pretty great feature. By purchasing more time at once, you can save a significant amount of money. You may want to try a one-month subscription to get a better feel for the program. Then, if you like what you see, you can save money on a three- or six-month subscription or an annual subscription. 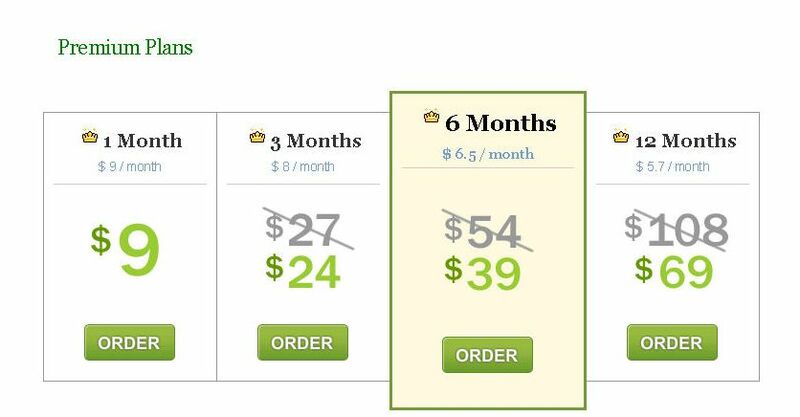 Unlike many other VPN providers, Leafy VPN has a refund policy in place. There is a three-day money back guarantee. If you cannot connect to the servers, you may request a refund within three days and receive 100% of your money back. You may not request a refund for speed related issues. While again this may not seem like much time, consider that it is plenty of time to test the connection and determine if you are satisfied. Leafy VPN has servers in over ten countries and more than 50 gateway servers. Countries include the United States, Great Britain, Germany, Japan, China, Korea, and more. You cannot choose your specific IP address, but you can choose the country you wish to access from. This makes it easy to view site content specific to that country. There are no restrictions on the bandwidth you can use, within reason. Abusers will of course be removed from the system. Otherwise, you are free to use as much bandwidth as you would like. Leafy VPN includes a simple and direct user interface which even beginners will have no problem understanding, navigating, and using to select countries and sites. Leafy VPN’s website has a simple, clean design, which reflects the design of their program. Users do not report many disconnects with Leafy VPN, which makes this a stable and reliable VPN service. It is wise to check the settings on your antivirus program to make sure that it will not interfere with the functionality of the VPN. Most stability problems come arise from antivirus software issues and can be easily and swiftly resolved. Speed is an issue where some users report performance problems. For many users, speed is unaltered, and some even report that download and upload speeds decline while using the VPN. This is not great, and if you are specifically looking for a way to speed up your connection, Leafy may do the opposite of what you are hoping for. Speed can vary quite a bit. Some logins may result in good speeds, while others may result in poor speeds. The speeds are sporadic and unreliable. Leafy VPN provides users with both 128- and 256-bit encryption on their connections. This is a nice bit of information which many VPN providers do not supply. Furthermore, Leafy VPN only stores information for three days for technical troubleshooting purposes. Some VPNs store information a lot longer, so this is good if privacy is a prime concern. In terms of support, Leafy VPN offers a contact page which is available to logged-in members only. Once you have logged into the support area, you have a couple of different options. You can purchase new VPN services or you can submit or check support tickets. If you happen to be interested in signing up as an affiliate, you can also do that here and profit off of referrals. The simple interface is easy to navigate and use. The drawback is that it is also very limited. Submitting support tickets is really the only way to contact the company and get assistance. Once you submit a ticket, it will be answered in “a maximum of twelve hours.” This isn’t terrible—at least you will hear back inside of a day. But if you need urgent assistance, there is nothing which you can do, because there is no phone number provided and no live chat either. We found other reviews where customers stated that true to their word, the company really does respond within twelve hours to support tickets, often less. So their TAT is reasonable and consistent with their promise. Again, though, if you are concerned about not being able to reach the company immediately, the lack of a phone number is a drawback. Leafy VPN has a lot of great features and a few drawbacks, which is what you would expect from a “middle of the road” company according to their prices. You will not lose an arm and a leg paying for services with Leafy VPN, but you do have to pay. In return for $6 a month, you get unlimited bandwidth and access to any sites you wish. You can also choose from more than ten countries for your IP address, which is great flexibility. You can look forward to great security and privacy as well. There is a free trial (we found a number of reviews which incorrectly stated that there wasn’t), so you can test drive this program before you purchase a month of service.